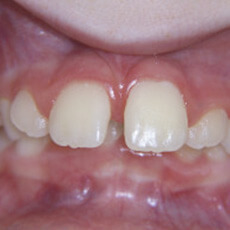 Protruding teeth are a common problem in both children and adults. Zaytoun Orthodontics, with offices in Raleigh, Cary, and Garner, offers years of expertise in fixing this issue! This condition can be caused by genetics, oral habits, or severe teeth crowding. If left untreated, what can protruding teeth cause? Correcting this problem can help reduce the risk of dental fracture and improve overall function. How do you correct protruding teeth? Protruding teeth, also referred to as “buck teeth”, can be corrected at any age. With early intervention, in many cases, we can prevent buck teeth from ever occurring. As early as age seven – a great time for preventive screening – the doctors at Zaytoun Orthodontics can detect the future possibility for buck teeth in young children. Protect protruding teeth from injury. Improve chewing with lips closed. Permit more restful sleep with less mouth breathing. Improve the aging process of the face, lips, and teeth by improving the position the teeth in the mouth.